Put some wood glue on two pieces of metal, press them together and it just doesn’t work. They fall apart. But it’s glue right? Whatever way you look at it. It’s just the wrong one for the job. The Incorrect application of a tool as such. The coaching world is riddled with reasons why you should or shouldn’t do things. Very rarely is anything put into different contexts and it’s application considered. I’ve written about this on numerous occasions and it still rings true. As coaches we need to consider application and much like the wood glue. It’s ability to adhere. Glue is glue but it doesn’t stick everything. A calorie deficit is a calorie deficit. But not everyone will stick to it. You have to find the right type of glue. Teaching a CEO to cook is pointless as he or she doesn’t realistically have the time to do that. Won’t stick. Asking someone with a young family to prep food every night isn’t feasible. Won’t stick. Telling someone they need to go to the gym 5 days a week when right now they can only manage 3. Won’t stick. An inability to listen to needs. An inability to use progressive change as opposed to simply ‘change’. We must be adaptive, considerate, listeners, democrats (that’s not political allegiance) and a multitude of other things. In many respects these qualities in a coach supersede advanced knowledge of the technicalities of training and/or nutrition. 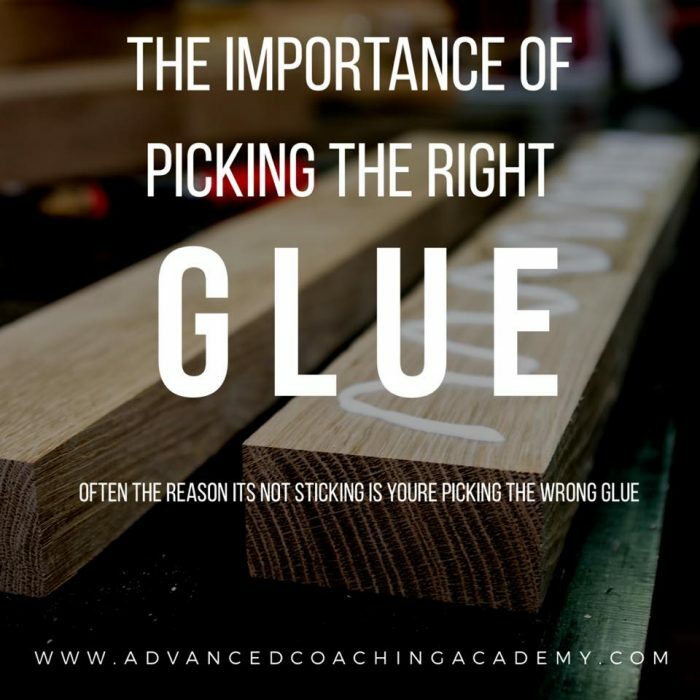 We must find the right glue for the right surface.